All in all, I'm really watching what I put into my body and onto it. So I'm trying to completely cut out unnecessary chemical or synthetic ingredients in my skincare, nail polish, and hair care. One step at a time as sometimes a girl can't let go of her manicures, but it's a rewarding process to discover brands that value well-being. One of these brands is Yon-Ka, a skincare brand I've mentioned previously in my routine. Their products are all natural-based, with ingredients you'll recognize (side note: I've become an absolute ingredient label fiend) and their pretty packaging just adds a bit of French chic to your countertop. Pictured above are some of my favorite products to use, including the Yon-Ka serum, which is a concentrated blend of revitalizing and hydrating oils with Vitamin E as an antioxidant (a nice little upgrade from my Trader Joe's Vitamin E oil). I use Lotion Yon-Ka everyday after cleansing as a refreshing toner and base for my skincare applications. And you must try the Pamplemousse - it leaves your skin unbelievably soft to the point where you have you restrain your hands from constantly touching your face. I use that as my daily lotion. 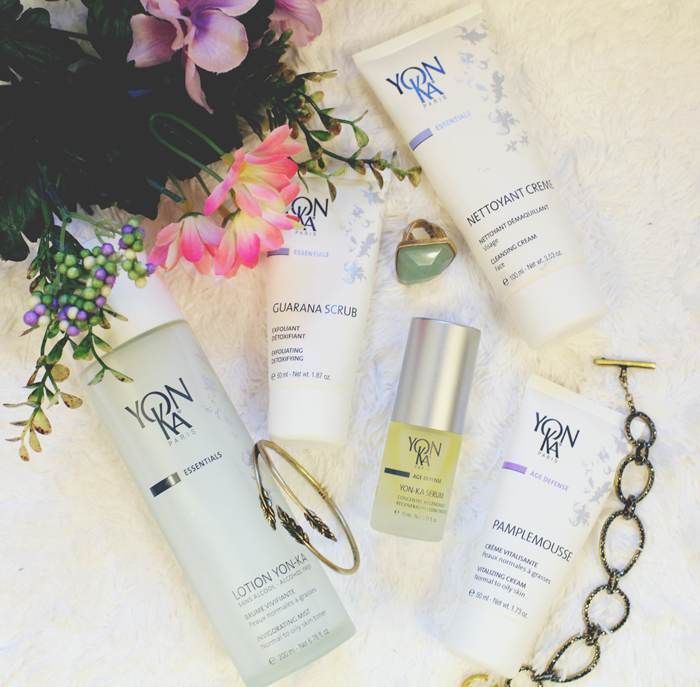 So to really get you excited for the brand, I've partnered with Yon-Ka to give you a chance to try them out! Yon-Ka loves you guys and they're going to give away one of your #YonKaFave products. AND you have two chances to win as both Yon-Ka and I will pick one winner each. Super easy to enter, just follow both of us on Twitter and tweet us your potential #YonKaFave product. Giveaway ends Wed Aug 21st. Good luck everyone and thanks for entering! I love YonKa's Netoyant Creme ultra gentle face cleanser. I have dry mature skin. This works great for me. I also love Yonka's Advanced Optimizer Serum. It works great to firm my face which it really needs.